Our product design programme allows young people to explore their creativity by designing and making several products, and learning about what it takes to market them. In the UK, there is a shortage of opportunities for young people to try creative and STEM-based activities at an entry level. Our Product Design course gives young people a starting point, and helps introduce them to the different pathways into design industries and the varying career routes. Product design is a unique programme, as the subject usually is only accessible to University students, but in reality a lot of young people are interested in this at entry level. We recently ran a product design course in partnership with Makerversity, a pioneering community of emerging maker businesses, professional designers and architects. Over the course of the week, the young people designed and produced products such as digitally-printed aprons, workbenches, mini-greenhouses, 3D-printed robots and plant pot holders, and more. Through this, they explored new STEM skills in digital and graphic design, software, electronics, 3D modelling and printing, woodwork design, measurements, production and assembly. One of the unique benefits of completing the course with Makerversity is that the young people are able to feel like they are a part of the community, and mingle with professionals that work in the building. They are able to see first-hand how these professionals work, how they started their career path, where entry-level opportunities in the sector might be, and learn how to use some of their equipment. For example, Marcus is keen to achieve his ambition of going to university for architecture. 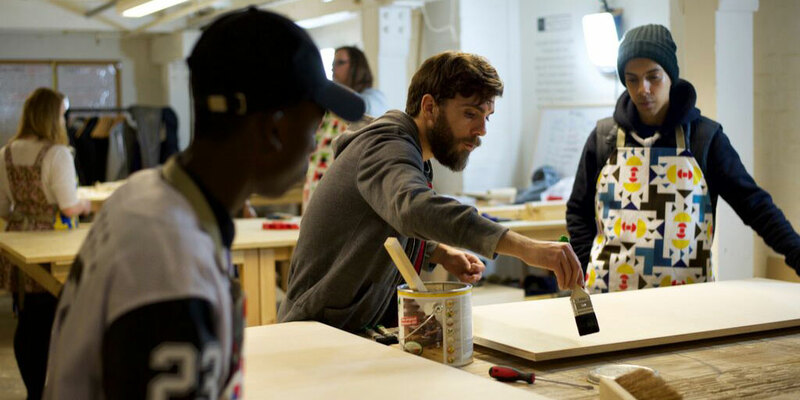 He felt that the product design course withThe Prince's Trust and doing an apprenticeship in engineering would complement his growing skill-set, but had no idea he would also meet professional architects at Makerversity. He chatted with a couple architects over the week, and planned to pursue work experience and shadowing with them to build on his experience. This course has been really decent - it’s helped me meet some architects that I might be able to work with in the future, and given me the chance to trial my engineering abilities. Product Design has opened up a wealth of opportunities (including work placements with Makerversity), developed unknown interests and passions in young people, and boosted many crucial skill sets: employability, confidence, and of course, STEM.